ActivSlate 60 with A5 graphics tablet with ActivPen 50 – 1 x ActivPen 50 included. Requires ActivHub. The ActivSlate enhances teachers’ abilities to deliver truly interactive, engaging lessons, while providing the freedom to instruct from anywhere in the classroom. In an interactive classroom, nothing is static. Subjects, ideas and participants come alive in learning environments filled with movement and energy. While students enjoy interacting in front of the class at the ActivBoard, teachers also want connection and freedom of movement—to instruct from student desks, stimulate debates from the four corners of the room and direct lessons during group projects. ActivSlate provides the flexibility to lead versatile, interactive activities by giving anyone the ability to control the ActivBoard from anywhere in the classroom. A wireless, fully integrated notebook-sized tablet, ActivSlate uses the same ActivPens as our ActivBoard, is small enough to sit on a student desk and is light enough to be passed around the classroom. Interactive - The same interactive functionality as the ActivBoard, accessible from anywhere in the classroom. Mobility - The ActivSlate is small enough to sit on a student desk, and is light enough to be carried into the center of any discussion. Enjoy the freedom of interacting with lessons, controlling applications and annotating content from anywhere in the classroom. Low cost of ownership - The accessible, rechargeable and replaceable Lithium-Ion battery provides long life. Instant-on mode ensures immediate interactivity and reliable, wireless connectivity, while sleep mode provides longer battery life. Integrated - Seamlessly integrated with ActivInspire, the ActivSlate enhances teachers’ abilities to deliver truly interactive, digital lessons from anywhere in the classroom. All ActivBoards; also works with 3rd-party interactive displays. Note: Does not require an interactive display to function. Wirelessly with the ActivHub 2.4 GHz inserted in a computer. With ActivBoard 500 Pro and 300 Pro, the hub can be inserted directly into the USB port on the board. Windows, Mac and Linux (see Specification Sheet for complete details). 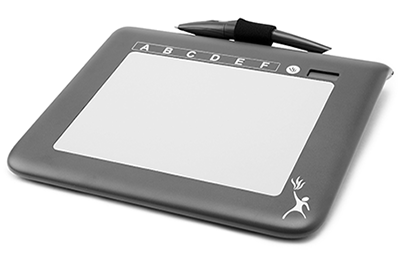 Operation and setup of the ActivSlate 60 requires ActivInspire Personal or Professional Edition software and ActivHub. Find specifications and access for ActivInspire at Promethean Planet. User with administrator/privileged access rights required for software installation.